The Most Overlooked Piece of Pond Equipment! A pond pump can only work as well as the plumbing system allows it to. In constructing a water garden, one of the most important and most overlooked pieces of pond equipment is pond tubing. 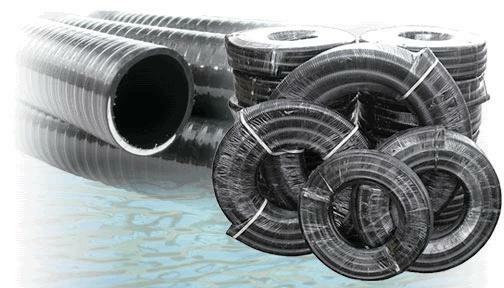 If you do not use the proper size tubing in your pond design, you will not get adequate flow, proper filtration, and potentially burn out your pond pump. A larger waterfall pump does not always mean more water. You can only fit a certain amount of water through a certain size pvc hose. For example: If you have a pump that is rated for 7200gph you do not want to use a 2" flex hose. You are only going to get about 5400gph coming out at the end of the hose. You would need to use a 3” hose. Yes, it’s more money, but it’s cheaper than replacing a burned out pump. I know head height, elbows, etc. have a factor in the water flow but I’m going to keep it simple for this pond blog. Here are the figures I use in pretty much all of my quotes.